The books on new orientation regarding researching the historical Moses and his significant Egyptian background, were received by readers, science, and the media with genuine enthusiasm. Now we can experience the largest number of intriguing discoveries and concrete results of research on this far-reaching field - which appear to be also of particular relevance in our era. These books by the Danish author and researcher on history, Ove von Spaeth, open up to a unique knowledge treasure and wisdom from the Greeks, mighty Rome, and the Renaissance - and the original source in ancient Egypt - also seen in perspective in the light of modern science. 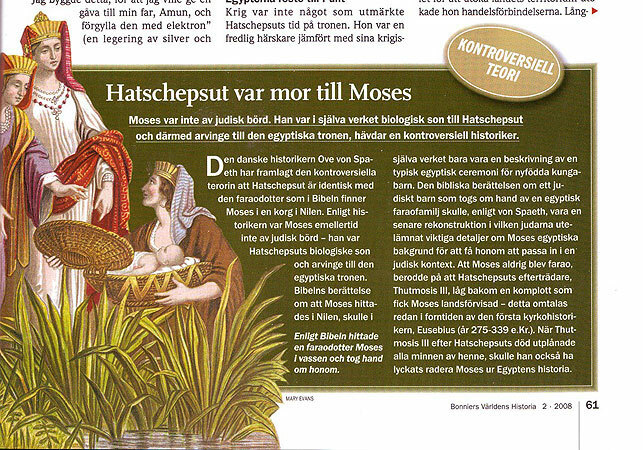 An influential and versatile personality, the first prophet in the Bible - the historical Moses, is presented by a full-scale investigation through this work written by Danish author and researcher of history, researcher Ove von Spaeth who has studied the still significant clues and surprisingly many survived keys. According to scientific reviews: this thoroughly documented discovery series will convincingly be appreciated and debated by a broad, international audience which also covers non-professionals as well. A brief overview of Ove von Spaeth's books is given here in aggregate form. Quick insights into the extensive content of the book-series' five volumes about the historical Moses, are presented by some ultra-short summaries below. Firstly, however, author and futurist Ulla Runchel's inspiring introduction to the series is presented here. Further below, the individual summaries of the books follow. 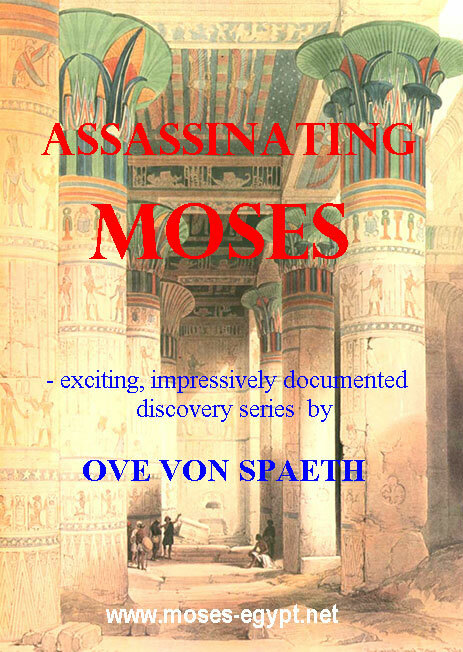 OVE VON SPAETH has made a MASTERPIECE - even 5 books about Moses, - the books I can recommend WARMLY. This author guides us into an exciting and compound time travel, which is so complete, carried through in choice of words and research in ancient writings, star maps, and papyrus scrolls, and with lots of surprising info that it takes your breath away while you are following "the golden thread" all the way through all the books until you have turned the last page. A travel into present of the past - by these books you can be "buried" in the consciousness via the narrating historical panorama, which the author is leading us into. A presentation, which even penetrates enigmatic mysteries, making the reader rejoicing in enthusiasm. Ove von Spaeth enchants us with a great primeval knowledge transformed into a present time language, so that everybody is able to join in, many thousands of years ago, following MOSES' travel of wonders into several levels. - A masterpiece, which simply must be read - and even read several times while the books reward us with further profit. Really, it would be a fine intention also to use the whole book-series in the school, because the language is so worked through and written so precisely in order to be unmistakable and make clear the greater and often very surprising coherence of the historical course. The children of the future would have, at their task of learning, a great benefit by reading this material and here, by working with the sense of the language, as a base to practice communication. - also presented here is his solution of the enigma connected with Egypt' most ancient star map: www.moses-egypt.net/star-map/senmut-survey_en.asp . A view - "Assassinating Moses"
The enigma of Moses - re-evaluated! Historical Moses, his fate and mystery are presented for the first time with its rich course of events. Ove von Spaeth has carried out interdisciplinary research on enigmatic Egypt and written a fascinating work providing new orientation on the historical Moses' exceptional life. The books bring to light unique insights previously not possible to show. New knowledge behind history, - new data and discoveries regarding Moses' true status and era. Amazing findings influence history with important extensions all the way up to present time. The author's books with their great history project reveal Moses from new, unusual angles and give a keen insight into ancient Egyptian mystery cults and initiation rituals and the traces of Egypt's spiritual impact on the laws of architecture and pictorial arts. The reader is taken on to an exciting expedition of exploring within scientific studies in Egyptology, religious history, Bible analysis, archaeology and the old astronomy - all presenting Moses through new surprising angles of incidence. A convincing, appreciated work. Rediscovered accounts in the very ancient Rabbinical texts and in Egyptian sources reveal that the Bible's greatest prophet was born as a prospective heir to the Egyptian throne. However, enemies at court and in the priesthood obstructed his chances of becoming a pharaoh. Rare, ancient handed down information confirms the Egyptian base of this unique biblical leader. Everyone knows about the story of Moses found by Pharaoh's daughter in the reeds by the Nile’s riverside - but was he just a myth? Or did parts of modern biblical research commit "murder on history"? a well-defined ritual practiced for royal heirs. Via astronomical dating which can be verified objectively on the basis of modern scientific astronomy, knowledge of Moses' era and status is restored; the book's thorough documentation makes possible the solving of many biblical enigmas. "... This work probably renders the most original, and in various ways most well-documented presentation of an answer to the Moses enigma within modern research. A grand synthesis ...One feels more than intellectually enlightened and enriched as a human being ...". "... With nothing less than formidable control of historical developments and interaction within the Mediterranean region and the Near East. - Profoundly fascinating ..."
Historians have questioned how Moses could have left the Land of the Pharaohs without a trace. Now, exciting new findings and substantial evidence indicate the presence of Moses in Egypt 3,500 years ago. New information, decoded with the help of modern astronomical methods used on the world’s oldest star map - found in 1927 in secret Egyptian burial facilities, at Luxor, - presents accurate dating. This makes it possible to substantiate significant material on Moses' existence in ancient Egypt during the 18th dynasty. The book is the first to explore and develop the genuine Egyptian context with regard to Moses. Data from archaeology, Egyptian astronomical records, and ancient inscriptions as well as the Rabbinical Talmud texts show why the traditional concepts of Moses' identity and fate need to be critically revised. The sources strongly indicate that Moses was a high-ranking leader among the Egyptian elite - and offers a master key to uncover a large-scale political intrigue at Pharaoh's court which led to Moses' exile. The "silent years" of Moses' life can now be revealed and heard. "... the results of modern research all the way up to the present have been applied and discussed to an astonishing extent. - Well-articulated, thought-provoking - it has the potential to change our present view of the historical sequence of events in the Near East in the second millennium BC ..."
"... Ove von Spaeth appears to be one of our boldest scientists. - He takes a distinctive approach as a historian - he fills the imagination of his readers with his discoveries about Moses ...(and) has prepared a brilliant, logical solution or true stroke of genius ..."
"... Without any knowledge of astronomy I am nevertheless convinced that from Egyptology's point of view the paper by Mr. Ove von Spaeth contains new and valuable information concerning the date of Senmut's star map ..."
Ancient texts and a variety of sources indicate that Moses was an exiled Egyptian prince who repeatedly attempted to regain his claim to the throne of the pharaohs by availing of the context of historic tensions then existing in the Middle East. A coup prevented Moses from ascending the throne of the pharaohs, a position for which - according to ancient Jewish texts, i.e. the 'Rabbinical Writings' - he had been designated and educated. A number of rare sources indicate that Moses continued to intervene in the political affairs of Egypt from his place of exile in order to regain his claims to the power. New light and understanding are now brought to the image of Moses and this "forgotten feud". This book unfolds the unresolved circumstances behind Moses’ extraordinary role in Egypt and the history of the Hebrews which led to changes across the Middle East. Several rare and old sources reveal that in response to the untimely coup that prevented Moses from ascending the throne of Egypt - a position for which, according to ancient Jewish texts (the 'Rabbinical Writings'), he had been designated and educated, - he instigated a major rebellion with the aid of Hebrew immigrant workers and of many Egyptians. It was not until the end of this attempt that these peoples sought another land and their own sovereignty. The oldest Moses traditions include information on rare astronomical phenomena, providing a unique correlation to be revealed between source material and dating. In addition, archaeological finds illuminate the data of the ancient scriptures which also seem to provide clues to Moses' secret bases where the people of the Exodus hid in 'the desert' for many years. A realistic background is unfolded of the crossing over the Red Sea. For the first time in the history of scholarship, larger contexts are developed of ancient mystery cults with religious and magical contents and practices which were also politically active and powerful in their own ways. "... a trail-blazing work with revolutionary results ...an amazing experience every minute. - A high-quality foundation that commands respect in every context ... ". Moses is the first known founder of a religion - and he has inspired several world religions. Ancient sources reveal that his teachings originally included the 'mystery gold' from Egypt and the secret of the god-name. The 'Egyptian factor' has been underemphasized in Biblical research, but now it can widely established as one of the most important prerequisites for understanding the vital circumstances behind the oldest contents of the Bible. - Through later centuries, lay-people were prohibited of reading the Bible which was placed at the top of the "black list" (the 'Index...Prohibitorum') by the Catholic Church. Prior to that, hidden teachings had reappeared in Egypt among Gnostics and in the Hermetic doctrines which later contributed to the Renaissance. Valuable findings about the Bible’s greatest prophet who was a highly educated Egyptian prince and a claimant to the throne. He created an advanced code of law but many of his revolutionary and visionary innovations were later ignored. New knowledge about the real person behind the myth and his influence as well as importance for our current cultural contexts. Antiquity greatly esteemed Moses for his versatile talents as a military commander, philosopher, mystic, magician, healer, inventor, and a learned astronomer. The book utilizes and re-vitalizes unique material from new discoveries and finds, revealing unknown aspects of the enigma of the historical Moses. As well, it uncovers Moses' far-ranging and exceptional achievements as recorded in rare and ancient sources. The Mosaic Law, for example, is a most advanced ancient code with remarkably modern elements: environmental laws, social laws, asylum rights, human rights law, debt relief, animal protection, hygiene rules, and military ethics. In addition, the book uncovers an astronomical background for the Pentateuch texts which mention stars and celestial bodies as well as his calendar for the Israelites. The book contains a comprehensive presentation of historical relationships to the world's first alphabet - the Sinai-alphabet - also indicated in the Bible which is the oldest book written with the use of the alphabet. - Moses is one of our early history's most insightful and spiritual personalities. The book brings to life unique material about Moses' extraordinary and eventful background in and outside of Egypt. "... an impressive depiction of a man straddling the dividing line between history and prehistory and who according to this congenial depiction actually created this line. - The sources as presented by the author enables the reader to span vast distances in time, space, and argumentation. ..."
"... Read with great interest - and in recognition of many fine observations and details. ..."
New discovery in the world's oldest star map - the exceptional map by Senmut, the vizier. a defined celestial sector. This implies in itself information about a specific time. The decoding can be verified objectively by modern astronomical computing. A similar planetary gathering with the same celestial localization and precise placement can be seen "copied" also on later Egyptian star maps. This edition of Ove von Spaeth's essential new-orientating treatise was originally published in the "Centaurus International Magazine on The History of Mathematics, Science and Technology", 2000, vol.42, pp.159-179: - This scientific pioneering work has gained genuine admiration and international respect for its untraditional observations and for finding the solution to the difficult problems of decisive significance in ancient Egyptian astronomy and chronological perspectives. The findings in question have furthermore supported research regarding an improved dating of Moses' historical period. "... The findings are very ingenious and admirable, and quite surprising considering the apparent lack of interest of the Egyptians in this sort of astronomy ..."
- Owen Gingerich, Research Professor in Astronomy and the History of Science, The Harvard-Smithsonian Institution, Astrophysical Observatory, Cambridge, Mass. "... Your article on the Senmut ceiling, with so many interesting observations. ..."
- Erik Hornung, Professor Dr., Ägyptologisches Seminar der Universität Basel, Schweiz. "... This important and fascinating paper, many congratulations on the research - it is a major advance. ..."
- Sir Patrick Moore, D.Sc., Astronomer, CBE, FRAS, Science Editor for BBC. Credentials : - about the author, statements from a number of scientific experts and professionals can be found e.g. on these pages: authordata-4: Reflecting views - and Zenith IC Project . C.A. Reitzel Publisher and Bookseller Ltd. Updated and expanded - several hundreds of web pages !! - Bilingual. history of research now unlocked for posterity. disclosing a hitherto unknown message hidden in the world's oldest star map. 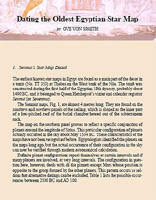 controversial historian Ove von Spaeth documenting Hatshepsut was the mother of Moses.